I am not sure if I have ever mentioned this before, but I really love to read the monthly roundup/gratitude posts by the bloggers I follow. For several reasons really, but most importantly because I feel like it’s through these posts that I actually get to know the person behind the blogger, and it helps me connect with them more. Moreover, it’s almost like the virtual equivalent of catching up with a friend over coffee, finding out how they are doing, and bringing them up to speed with what’s going on in your life. And so naturally I’ve wanted to start writing these posts on my blog as well (though for very different reasons). But in the past whenever the end of the month rolled by and I attempted to write a monthly round up/gratitude post, there was not much I could recollect – it all seemed to be a blur of sorts. Which is why this time I started jotting down things in the Notes app on my phone, as and when they happened during the course of the month, so I did not have to rely on my (really terrible) memory for that. However, interestingly, my notes this month happened to serve as much more than mere reminders of the highlights of the month gone by, they actually managed to change how I perceived the month. And I know this because at first I tried drafting this post without referring the notes I had made on my phone, just to see how much I recollected. And as I should have expected, I still seemed to be in dire need of memory pills, because I couldn’t remember much of what had happened (with one exception) during the past month. I mean of-course I had a general idea, I felt like overall January had been an okay-ish month, where I got stuff done, but nothing out of the ordinary. But I was wrong. January was not an okay-ish month, it had been a fantastic one, on many accounts. Of-course the biggest highlight of the month was finally launching my food blog, after years (and years) of wanting to do it. And so clearly this was the exception mentioned above. It was the one thing I remembered about the month when I tried drafting this post without referring my notes. Speaking of The Love of Spice, the site still needs some work on the back-end, but it’s at-least completely functional on the user end, so I’m glad that I pushed through my excuses to get it live last month. Especially because the response has been amazing, gratifying and overwhelming all at the same time. And for that I have to thank all of you, my readers, friends, and fellow bloggers for cheering me on and always being there for me. I don’t think I can fully express how much your support and encouragement means to me. Okay, so I do realize that in my excitement for the new blog, I have skipped through most of the month, and gone straight to the final days, so let me back up a bit here, because January has been wonderful to me in so many different areas, that I don’t want to gloss over the other things. However, keeping first things first (ah the irony!) – on the very first day of the month I got myself a brand new planner, which by the way I absolutely adore. Over the years I have tried many different planners (even though I only began using them on a daily basis last year), but I have to say that so far The Day Designer is clearly the winner in terms of function (for me). I took the relatively inexpensive one without the fancy custom made art etc (though there are many different options if you are so inclined) but I couldn’t have been happier with my purchase. In January, I participated in the FMS Photo a Day Challenge on Instagram, which I know is not a big deal for many of you, but for someone who can’t even take a decent selfie to save their life, committing to a photo a day wasn’t necessarily the easiest thing to do. Also, I had seen this challenge around, and while I enjoyed looking at the photos and cheering for other people, I felt like I did not have the mental bandwidth to deal with one more thing on my task list. Especially something I was terrible at. Nonetheless, I took the plunge in Jan, and somehow even managed to successfully complete the challenge (even though on some days, I might have taken liberties with what a photo meant). And the best part was that it wasn’t even that big a deal to accommodate this challenge with the other things I needed to do. I guess sometimes it’s just a mental block. Then sometime during the middle of the month we went to visit my cousins in West Virginia, and explored Skiing. Okay fine, in the interest of full disclosure it was my husband and son who learnt to ski, while I was mostly posing (and falling even while posing), but then I am counting both those things under exploring, so you see.. Anyway, on a more serious note, it was a fun experience, and even when I was not skiing (fine, posing!) I got to spend a lot of quality time with my favorite aunt, which was kinda amazing, so win-win. Around the middle of the month, we also finally got the custom closets for our master bedroom done. This has been on our list for a long time, but there was always something more urgent or important that needed to be done, and so it kept getting procrastinated, but now that it’s finally done, I couldn’t be happier. I’ve yet to organize it, but oh well, there are only so many hours in a day, even if I wished there were more. And finally (and this is something I’m the most excited about), I seem to be completely acing my Quarterly Goals this time, because not only I am getting most of the things on there done, but going above and beyond, and doing so much more! I am especially happy with how well I am doing on my fitness goals, and it’s gratifying to see real results. But even blogging wise this year has started on a great note. I mean of-course there’s the launch of the food blog (which I clearly can’t stop talking about), but this is not only about that. This excitement is mostly springing from something that I’ve started working on for Shanaya Tales. It’s still work-in-progress, so I’ll talk more about it when things are closer to completion, but essentially what I’m working on is revamping this blog to better align it with my vision for it. It’s something that I’ve wanted to do since a long time, but had to put on the back-burner last year to deal with more pressing things on the home and health front. But now that everything else seems to going great, I am really excited to work on this pet project of mine. And lastly (I promise this is the last thing), I seem to be crushing my reading goals so far this year. I typically read 2-4 books a month, but in January, I managed to read 6 books (and have already gotten through 4 more in Feb). But here’s the even better part, I am finally on track to conquer my pending review backlog. I don’t think I’ve ever been able to honestly say that in the past three years. 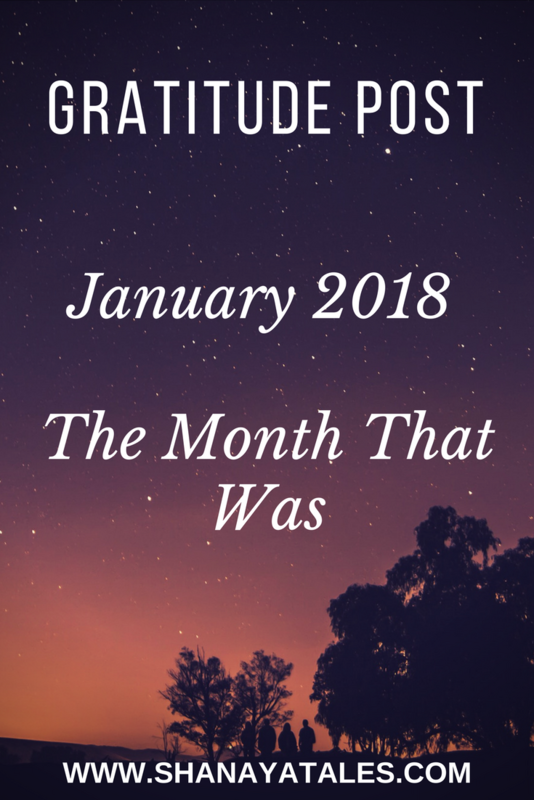 So you see, unlike what I thought at first, January wasn’t an okay-ish month, it was a really great one, and an amazing beginning for the new year. Now if all the other months are even near as good, I think 2018 will turn out to be a fantastic year. That’s all from my end folks. I would love to hear from you. How did your January go? What is the one thing you are most looking forward to doing in February? Do share! So wonderful that you finally launched the food blog. I can’t wait to hear more about what you have in store for this blog. And 6 books in a month is awesome! There are a lot of things that I have in my mind for this year and have started implementing them slowly, February is about working on them slowly and silently 🙂 Let’s see how that goes! Many congrats on the launch of the food blog Shantala – hats off woman!! Its tough to do one blog (in my opinion) and here you are doing two!!! Loved your chat up of January and it seems we both had milestone conquering month; linked up my post for a read here. 6 books is amazing; I have fallen behind on my feb target but am sure will catch up in a bit! Looking forward to hearing what are you plotting next on Shanaya’s tales – all the best with it! Yay to you writing a gratitude post. You know somehow I’ve never written down notes for my gratitude posts. I know I should and that way I will have more things to talk about. But there is an exercise I do daily at home with all of us talking about the 3 positive things that happened to us that day. Makes for great conversation too. Anyway so, so happy to see you do the gratitude post. It feels good, right? Oh and I love the idea of sharing 3 positive things with family. I and my husband share everything about our day, but I do it sporadically with my little one. I think I should make it a more consistent habit with him too. Wow! You did manage to achieve a lot in a month! I am at the stage where I see others gratitude posts and decide that I will do this from next month, but I somehow don’t know what to write! I will try your idea. Loved the new look of your blog, Shan! And, felt wonderful reading about your days there…Keep it up..may the trend continue, babe! The skiing part sounded the most exciting! I love the gratitude habit. Journaling has completely changed my perspective on the day/week/month gone by. I am so glad to hear about your gratitude posts and look forward to reading them. 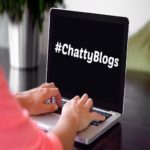 Hope to link up regularly for the ChattyBlogs from here on. I intend to do this for your blog and Vidya’s gratitude circle each month. Thank you so much, Shy. Hugs. So glad you launched the food blog, Shantala. But where are the new recipes? I’m so looking forward to it. Yay to more reading! I could hardly read a book or two, Guess I should just go for it. Thank you so much, Shalini. Well with the food blog – there were serious back-end issues – things I never faced with Shanaya Tales – something with the theme & custom coding. Finally fixed it now, so more recipes will come soon. I understand how happy it would be to view all photos good and old for a photo a day challenge. I participated twice last year. All the best for your new cooking blog. Skiing trip is great. Even I never tried skiing but we are planning one such trip coming week. Looking forward to it. Yay! I hope you have lots of fun. Putting down the gratitude pointers in the Notes is a great tip Shantala. Guess I should do it too. I’ve always wanted to write a gratitude journal at bedtime, but I get so sleepy by then. But thank god for Vidya’s Gratitude circle and other link-ups. Congratulations on kick-starting your food blog. and Wowsa! 6 books in a month. You amaze me and like how. These days unfortunately I struggle to even finish reading one. Sigh! Will link up soonest. Hugs and Cheer! Wow, it sounds like you had an amazing month! You’re crushing your goals, which is always lovely to hear about — i’m doing okay on my February goals and have hit two of my biggest benchmarks, which is a relief, but I’m having a hard time getting motivated to finish up some of the other stuff. Good for you, Shantala! What a fabulous month you’ve had! I think my favorite thing about January was getting through final edits of my short story collection. This has truly been a labor of love. I’m getting so close to a final copy edit. Again, congrats on your new blog. I’ve followed you on twitter for that one. So I look forward to reading and seeing more of your super recipes! Thank you so much, Lisa. For all the support & encouragement. Good luck with your book. When is the release date? Congratulations on the food blog. I know how hard it is to keep up with that. The easiest part is writing the recipe and the hardest part? Realizing sometimes you haven’t taken appropriate photos. At least with me! He he. You can do it Shantala! Start off with once a week, then you’ll find it easier! Ah, planner! Every year I stress over perfect and this year, I didn’t. I ended up with five “perfects” and laughed my head off because now I am stressing over not using all of them! The FMSPAD is so much fun. I first began in 2013 I think, when there was only Flickr and Facebook. This month I started off but abandoned it as I fell sick. How exciting to get closets done! Just reading this makes me want to reorganize mine. The highlight of your post is going well with your fitness goals! How wonderful! And yay! on your reading goals. Looking forward to your reveal about what you’ve got in store for your blog….and a big warm welcome to the Gratitude Circle! Hugs! Thank you so much, Vidya. I cannot tell you how rewarding writing the gratitude posts have been. I can never thank you enough for that. Hugs. Good to read that you had great month. It’s a bit of a coincidence that I’ve started doing something similar for recording my month – I keep a gratitude file open on my Mac and jot down things as they happen. Finally, at the end of the month I turn it into a post. Which is why I managed to do one last month and Feb looks good too. Congratulations on your reading. I did well in Jan but am falling behind this month. Oh and I am also trying to work through a planner – it’s a printable I found online but its working better than no planner at all. The link to your planner doesn’t seem to be working. PS:Congratulations on your food blog. That’s huge. Huh. It’s odd that the link doesn’t work. I will look up something similar on Amazon India, and try to share a link to that on FB. Hey that was a cool round up of Jan. You know what, I need to start jotting stuff on a daily basis too, maybe invest in a Penseive, what say? Launching your food blog was indeed a big news! You actually went skiing, how cool is that! Day designer, hmm have to look this up. Home projectts are time consuming but better go slow than mess up in haste. My reading’s been pretty awful so the lesser I say about it the better. Here’s wishing you a grand Feb, I don’t know How but Feb just slips past too quickly! Sounds like a lovely month! Congrats on the food blog. I agree about keeping a record of things to be grateful for — it really does help change your perception. I write in a notebook each night at least 3 things that went well that day and once a week, I highlight 10 things on the blog. I’m noticing I’m a lot more content than before and this is despite other stressors in life. I recently got myself a bullet journal, and I love it. I hadn’t heard of a bullet planner though – gotta look that up. 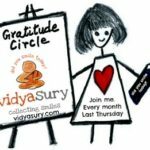 I love your weekly gratitude/round up posts. It was infact those posts, along with Vidya’s gratitude circle that inspired me to take this up. I need to amp my reading up. I took a sneak peek on your food blog looks delicious. Thank you so much, Zainab. Hugs. Very interesting post 🙂 Loved the way you plan and manage your goals. Very inspiring !